Musical Irish Angel Figurine with Shamrocks and Filigree Celtic Knot Wings. 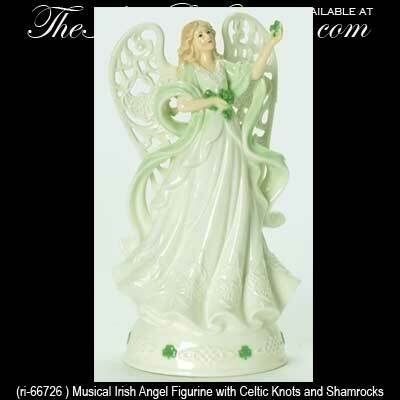 Irish Gifts - Musical Irish Angel Figurine with Shamrocks and Filigree Celtic Knot Wings. Her Gown and on the Base. White Porcelain with Green Accents, 8 3/4" x 4 3/4" x 3" Deep. Wind Up to Play "When Irish Eyes are Smiling."